You are invited to relive Lakeside, Ohio with your children or grandchildren!! Introducing the Lakeside for Youth ‘’345 Family Camp’’ for 2017!!! It may have been called ‘’Epworth League’’,’’ Lakeside Institute’’ or ‘’Lakeside for Youth’’, but not matter what it was called, you all remember that Lakeside, Ohio has been “the place’ for youth and adults to go for the last 90 years!! Since 1927, youth from this district have been going to Lakeside to grow closer to Christ and learn more about living lives that glorify God. We are offering parents and grandparents the opportunity to bring kids who are entering the 3rd, 4th or 5th grades in 2017 to experience Lakeside for a weekend. Just imagine the fun you can have with the kids at Lakeside showing them all the places and sharing all the experiences you had when you were there as a youth!! This is a weekend experience starting on Friday evening with our Annual Communion Service and Candlelight Walk to the Lake!! We will be joining the youth camp already in progress that week. Relive that great walk to the Gazebo just like when you were a teenager! You will have all day Saturday to experience all that Lakeside has to offer, along with VBS type programming for the kids. Chip Richter will be sharing his musical talents with the kids several times while you are there. Chip is the established song leader all summer long for the kids at Lakeside!! He is Awesome!! We will be there Sunday as well, continuing to experience all that Lakeside has always been with your children or grandchildren. This memorable event will be taking place June 30th to July 2nd, 2017! This weekend includes a Lakeside for Youth T Shirt for all attendees, all meals in Wesley Lodge (just like the old days! ), lodging for two nights, music, games and age appropriate programming for the kids! The whole weekend is only $90 per person, which includes the gate fees for Lakeside. Those of you who have been there know this is an amazingly inexpensive opportunity to spend a wonderful weekend at Lakeside with family. This will give your family an awesome weekend together at Lakeside and also give your kids an opportunity for a sneak peek at what their Lakeside experience is going to be for years to come! It will be an opportunity to grow in your faith, make new friends and have that famous ice cream and pizza at the greatest ‘summer place’ to be in Ohio!!! 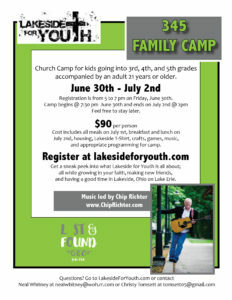 You can find all the details and also register for this camping experience at Lakesideforyouth.com. Don’t miss out on this inaugural event at Lakeside, Ohio!! It will be the first of many wonderful memories made for families at Lakeside!! Come and join in on the fun and the experience that only Lakeside can offer. Lakeside is the Family Place to be!! We look forward to seeing you and your kids this summer at Lakeside! Cya at Sloopy’s!!!! Best pizza in Ohio!!!! Or the Patio for Ice Cream!! Can’t wait!!!! !